Oh, now this is interesting. The Walking Dead is the latest offering from serial perpetrators of mediocre adventure game titles based on popular intellectual properties, Telltale Games. It features zombies, a concept which at this point is more tired and decrepit than World War 2 FPSes were in the mid-00s. The parts of the game where you play it – that is, where you as the player character actually get to do a thing – are scattered few and far between, and when they do occur the game spends most of its time railroading you down a gameplay path so linear it could easily double as the Death Star trench run in Star Wars. Do not buy it thinking you’re going to get a puzzler where you use gun on zombie, because this never happens1. As an adventure game, I have to say that the Walking Dead fails, and it fails hard. As a story, though, it excels. When I think of the epitome of games as a storytelling medium the words that flash unbidden into my brain are “Planescape: Torment”. The Walking Dead isn’t that good, but I think I could at least stand to mention it in the same sentence without breaking down in hysterical laughter. This puts it on a very short list of games. Vampire: Bloodlines. Some of Obsidian’s stuff. System Shock 2, maybe. It’s been a long time since I’ve felt as involved in a game’s story as I have in the Walking Dead’s. There were times when I didn’t want to carry on playing because I was so apprehensive about what might happen. It’s a visceral, brutal, emotionally draining experience that pulls absolutely no punches, and I finished episode two feeling soiled and tainted2 by the things I’d had to do to survive and to protect the people I cared about. How many other games do this? How many other games even try? It’s an outstanding achievement, and while I personally wouldn’t go this far I can certainly see why some people are calling it their game of the year. What is the Walking Dead, though? I’ve seen it referred to as “if somebody made a game out of Alpha Protocol’s conversation system”. While apt, this is not quite the comparison I’d go for. With the way the game is set up – a series of tense situations and crucial decisions that have to be made that is occasionally interspersed with a quicktime event where you kill a zombie – it reminds me far more of the obscure odd duck choice ‘em up King of Dragon Pass, which rested heavily on a similar collection of events and decisions with potentially far-reaching consequences. 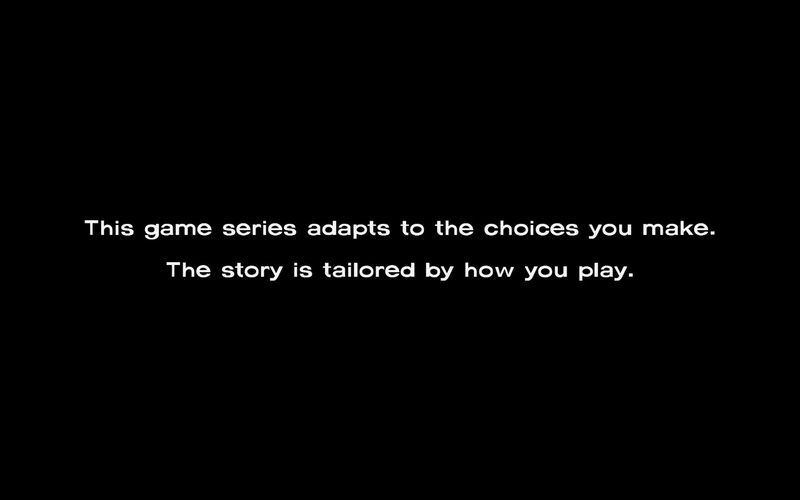 Your decisions in Alpha Protocol (mostly) only affected you. Your decisions in KoDP affected the future of the entire settlement, and it’s this feeling of responsibility for others that the Walking Dead brings to mind. Except here you’re not dealing with abstract numbers, you’re dealing with people. People with faces and names who talk and joke and have their own goals and priorities and who come to your aid when you need it and betray you when you least expect it. It makes the stakes so much more personal, and makes you feel crappy when you’re forced to stiff somebody in the name of pragmatism or the greater good or whatever. “Clementine will remember that.” “Kenny appreciates your loyalty.” “Danny notices your suspicion.” “You were direct.” “You tried to stay neutral.” This feedback is scattered throughout the game, a tangible sign that it is taking notice of your actions and that there will be consequences later. Not all of it ends up being relevant to what happens further down the line, but it’s necessary misdirection to keep you guessing as to what will and will not end up being important and introduces an important element of uncertainty to the game. You can never be sure that the decision you just made was a good one, and you end up being plagued with doubt as to whether you did the right thing as tempers flare and the relationships between the survivors begin to break down. This focus on the group of humans and their little social dynamic is probably the single smartest thing the game does. If you go all the way back to the start of the zombie genre as a popular phenomenon, Night of the Living Dead barely features the damn things except in a few wide shots showing them gathering outside the house. The film is all about the tense situation inside it as the survivors attempt to figure a way out of their predicament, and the Walking Dead takes a similar approach. I’m not saying zombies don’t play a prominent role in this game, because they do, but it’s as an omnipresent, mostly-unseen threat rather than as physical entities attacking the player. In some ways, in fact, the Walking Dead is the zombie game I’ve been waiting for; one where the zombies function as a catalyst for the story and not as the sole point of the game itself. It makes things so much more interesting and carves out a whole new niche for the game to sit in that by all accounts has made the Walking Dead quite successful. Like I say, a smart move. Of course this approach wouldn’t work if the game didn’t make you believe in its characters as people. The player character is Lee Everett, a convicted murderer on his way to prison. The game isn’t that ambiguous as to whether or not he did it – you can outright come out and say you did to a couple of characters if you want – but he’s not some hardened killer who can shank a zillion zombies in the face before breakfast. He’s just a guy who made some very bad decisions, and who is granted a reprieve from his punishment when the car taking him to prison gets wrecked by a zombie in the opening scenes of the first episode. Shortly after this he encounters Clementine, a little girl whose parents have become trapped in another part of the country (and who may or may not be dead), and whom he adopts in order to keep her safe from the undead apocalypse unfolding all around them. The Walking Dead heavily stresses the Lee/Clementine releationship. 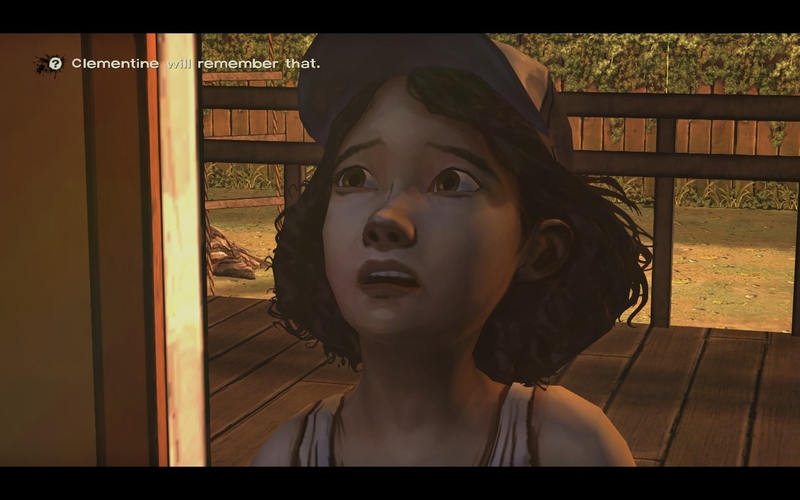 Clementine may be smart and canny for her age, but she’s still a little girl and provides the game – and Lee – with a much needed streak of humanity. It becomes harder to treat situations with Video Game Logic when there’s a six year old girl watching everything you do. Even though she’s not real, even though she’s just a collection of voice-acted polygons, Clem’s opinion of me somehow mattered. I didn’t want her to stop trusting me by doing horrible things in front of her. It doesn’t rule out acting like a complete psychopath, of course, but it brings things closer to the genuinely uncomfortable sociopathy of Planescape Torment than the pantomime villainry of KOTOR. The other survivors you encounter are a mixed bunch. I’m not going to say the writing for them is particularly outstanding, but it’s believable enough for me to buy them as distinct people with their own personalities and agendas. An interesting thing about the Walking Dead is that it doesn’t do the usual videogame thing of setting Lee up as the leader of the group because he’s the godlike player character. Lee is just a regular guy, and while he can give his opinion the other survivors won’t necessarily agree or do what you say. 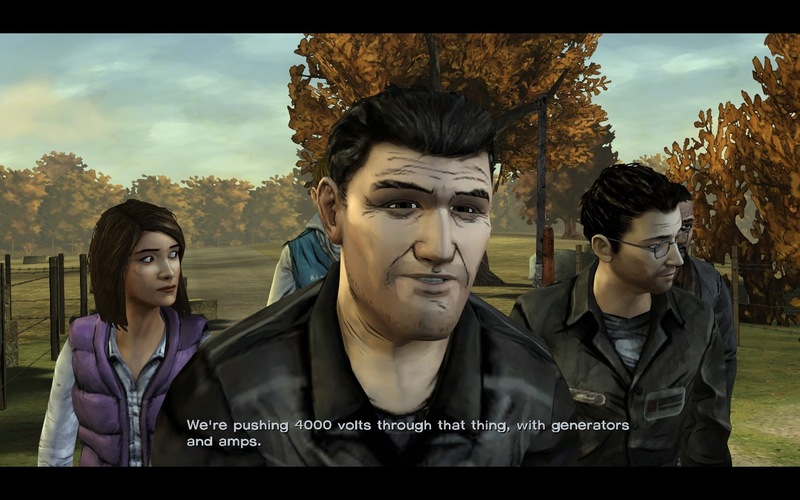 This is often used to set the boundaries of the narrative – certain things will happen no matter what you decide to do, which is disappointing but understandable given how complicated the storyline would be otherwise – but it’s also used to toy with your expectations of how the Walking Dead is going to work as a game. As in, it’ll make you think a certain situation is governed by video game rules – player inputs actions, game spits out feedback based solely on their performance – only for something completely unexpected to happen that was completely out of your control. Done badly this could have been a fatal misstep for the game, but instead it’s a tactic that’s utilised to great effect on several occasions. It’s a clever subversion of the Video Game Logic I was talking about above, and it’s to the Walking Dead’s credit that it plays with this as much as it possibly can. Of course it isn’t perfect. The game is less subtle about its narrative restrictions than it could be, and it also goes too far out of its way to signpost critical decisions. I liked the conversation system because I could see my responses were being noted by the game but I didn’t know what was going to be important. I don’t like scenarios that tell you to “Save Character A or Character B!” because they boil everything down to a single decision that pays no heed to the responses I gave previously, rendering them a little bit pointless. There are several sections of gameplay that are literally on rails, and while the interpersonal dynamics are really well done the need to adhere to a strict story structure for the overarching narrative leads to Lee contracting Adam Jensen syndrome on several occasions, where he’s forced into doing something really dumb in a cutscene while the player screams impotently at the monitor. There’s also some weird performance issues that were particularly prevalent at the start of episode one, where the game would take several seconds to catch up whenever the camera angle changed. The Walking Dead doesn’t look like it’s particularly demanding on graphics cards or processors, so I’m slightly disappointed that that sort of thing made it into the final product. Still. The Walking Dead is a brave attempt to do new things with the genre, and you’re not going to make any progress in life without making a few missteps along the way. There is one last thing I should mention before wrapping up, though, and that is that I really wasn’t kidding when I said the Walking Dead didn’t pull any punches. It features some of the most gruesome violence I’ve ever seen in a video game, and it’s made all the more graphic by the fact that this isn’t some cartoony bloodfest like Mortal Kombat, but instead a bleak story of survival during the end of the world. Much of the violence is human-on-zombie or zombie-on-human; however, there’s still two or three moments which are frankly shocking in their brutality. Personally I thought it was a justifiable use of violence as a tool which underlined how desperate and awful the survivors’ plight was and that it wasn’t gratuitous in the slightest, but you should be aware that even if you think you have a particularly strong stomach for this sort of thing you will wince several times during your playthrough of this game, and if you don’t think you can handle watching that sort of thing then it’s probably best to steer clear. That’s probably the only group to whom I wouldn’t unequivocally recommend the Walking Dead, though. I’ve only played two-fifths of the finished product but I feel like I’ve gotten my money’s worth out of the first two episodes alone. 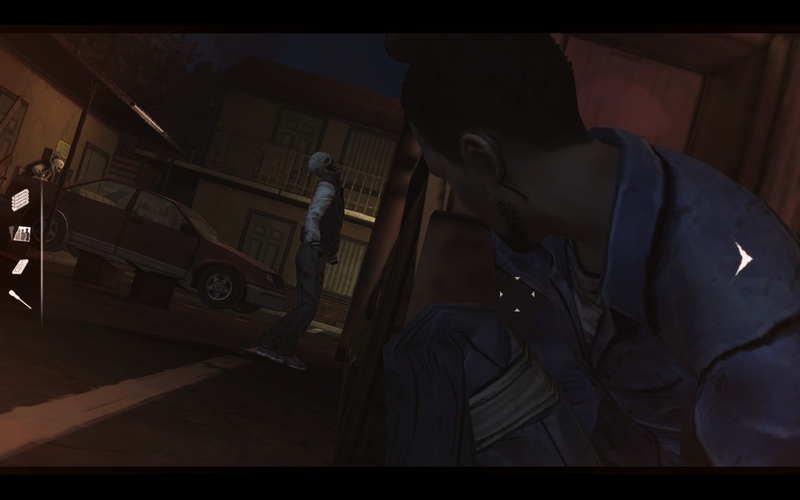 If you don’t like adventure games you should still take a look at the Walking Dead because it isn’t an adventure game as you know it. If you don’t like Telltale games – well, neither did I, and look at me now. Everyone else should at the very least put this on their list of Things To Buy During A Steam Sale simply to see what Telltale have done here. It’s probably the first major step forward for adventure games in fifteen years, not to mention a rare attempt to tell a story in a video game that is genuinely mature and emotionally involving. I enjoyed it immensely. Perhaps you will too. You use everything but a gun on zombie, but only in scenarios where you have one item and a zombie in front of you and you cannot go backwards or sideways. So essentially it’s a good game because it isn’t good as a game (as in, it subverts video game logic ™)? I may have to look into it then, I do grow weary of using VGL on a situation, rather than real life logic. Arguably it’s other games that aren’t good games because they don’t. I shouldn’t be able to predict the outcome of a given situation in a game given my prior experience with other, unrelated games, and the more VGL is used the more video games become their own little worlds that have no connection to the actual, real world. Quality aside, how many other developers put such an emphasis on writing as Telltale? Bioware, Obsidian, Rockstar, and Valve are the only big ones that come to my mind. What are some other companies that consistently do much (or try to do much) with their writing? I nominate SuckerPunch based solely on the first three Sly Cooper titles (seriously, I think Bentley may be the most well-developed character I’ve encountered in a video game series, and he’s a CARTOON TURTLE). Sounds like the sort of thing I might encounter on a CONSOLE to me. Seriously though, I think the problem with videogames is their action movie mentality. I think perhaps it’s correct to think “We should get the gameplay right and the writing should be a secondary consideration.” in *some* cases — after all, I can think of many great games with garbage plots, whereas the list of games with great plots and awful gameplay is populated by critical darlings that were, nevertheless, commercial failures — but the problem with applying that approach across the board is that there is simply very little development room for a title like Walking Dead. And so it’s only the really big companies like the ones you mention (and Obsidian) who really have the latitude and the inclination to even try to make a decent job of it. I’m not convinced that only big studios can focus on narrative. I used the SuckerPunch example because the Sly series is a pretty conventional video game franchise: action-adventure-stealth gameplay (that is essentially a prototype of Assassin’s Creed and Arkham City) populated by family-friendly cartoon animals. The games are pretty linear and never really hit it big, although they did well enough that a fourth game is coming out. What makes the difference, I think, is if there are people working at the company who can approach both the mechanical and narrative side of things. Part of why the Sly games worked is that the plots were heavily tied to the gameplay; Bentley’s characterization had as much to do with his animations and abilities as his dialogue. Compare this to Bioware, which often segregates the two; consider the fact that in Dragon Age II being a blood mage has no effect on the plot, despite blood mages being one of the crucial pieces of the story.